On Tuesday 27 November 2018 public hearing of PBI UMY was held. This agenda was executed from 11 a.m to 1 p.m. Public hearing is conducted once in each a semester. Sri Rejeki Murtiningsih, Ph.D., the head of the department opened the event. 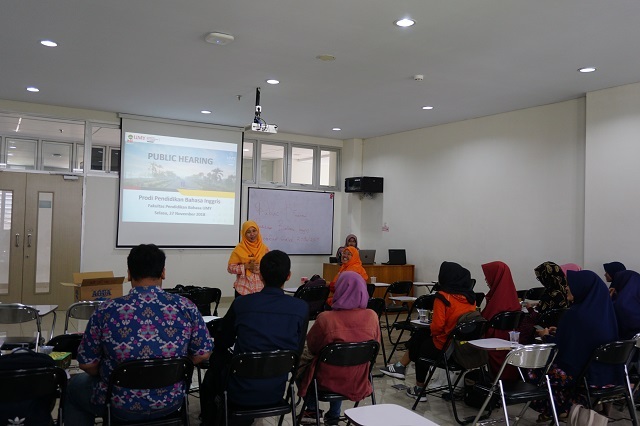 She mentioned that the goal of the public hearing is to hear PBI student’s aspiration and opinion on teaching and learning process in PBI UMY, so teaching and learning process in the department can be improved. Every representative of each class in PBI batch 2015 to 2018 attended the hearing. There were two sessions of the event. The first session was a disscussion with lecturers, which was led by Sri Rejeki Murtiningsih, Ph.D and Indah Puspawati, S.Pd., M.A. In this session, students stated their opinion and complained about lecturers and learning processes. Ms. Jackie currated and summarized students’ points and would pass the message to lecturers. In this session, student did not only complained but they also conveyed the appreciation towards teaching and learning process in PBI. One of the appreciation is about bridging course this year. One student stated that this year bridging offered more comfortable ambiance and agenda. Afterwards, several issues were addressed and discussed by both the head and the secretary of the department. Public hearing was then continued to second session. The session was led by two PBI staffs, Mas Didit and Mbak Aida. This session is quite similar as the first session, but in the second one students can convey their opinions anonymously. It offered some freedom for those who had been hesitant to voice their opinions due to their fear of being resented by the department. Despite the fact that this fear may not be solidly based, the absent of lecturers during the hearing can allow students to be able to share their concerns freely. This public hearing was important for lecturers and students as it offered as space for lecturers and students to sit together and voice their opinions. The feedback given during the hearing will help improve many aspects of teaching and learning process, and beyond in PBI UMY.